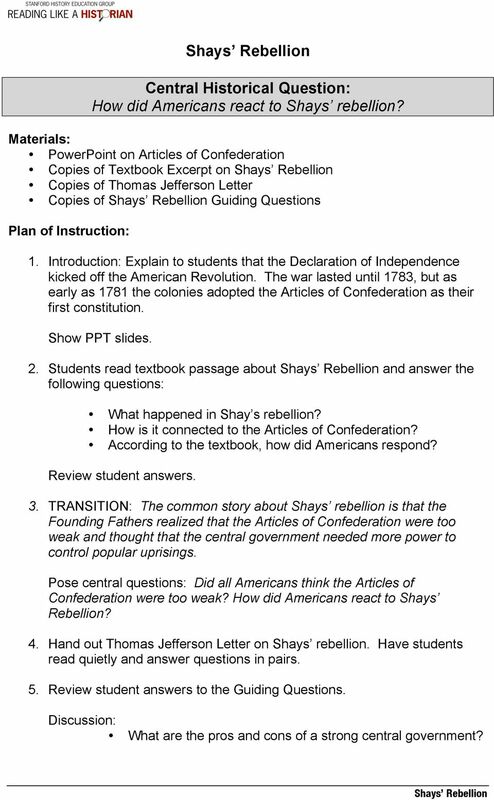 Download "Shays Rebellion. Central Historical Question: How did Americans react to Shays rebellion?" 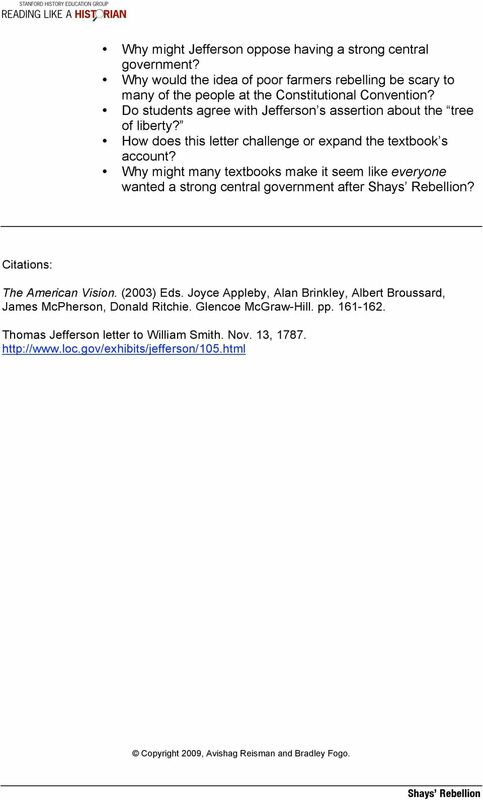 1 Central Historical Question: How did Americans react to Shays rebellion? Materials: PowerPoint on Articles of Confederation Copies of Textbook Excerpt on Copies of Thomas Jefferson Letter Copies of Guiding Questions Plan of Instruction: 1. Introduction: Explain to students that the Declaration of Independence kicked off the American Revolution. The war lasted until 1783, but as early as 1781 the colonies adopted the Articles of Confederation as their first constitution. Show PPT slides. 2. Students read textbook passage about and answer the following questions: What happened in Shay s rebellion? How is it connected to the Articles of Confederation? According to the textbook, how did Americans respond? Review student answers. 3. TRANSITION: The common story about Shays rebellion is that the Founding Fathers realized that the Articles of Confederation were too weak and thought that the central government needed more power to control popular uprisings. Pose central questions: Did all Americans think the Articles of Confederation were too weak? How did Americans react to Shays Rebellion? 4. Hand out Thomas Jefferson Letter on Shays rebellion. Have students read quietly and answer questions in pairs. 5. Review student answers to the Guiding Questions. Discussion: What are the pros and cons of a strong central government? 2 Why might Jefferson oppose having a strong central government? 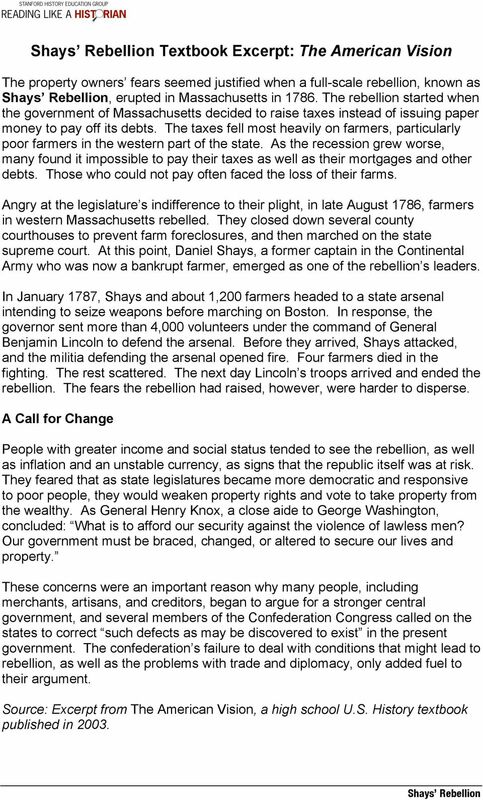 Why would the idea of poor farmers rebelling be scary to many of the people at the Constitutional Convention? 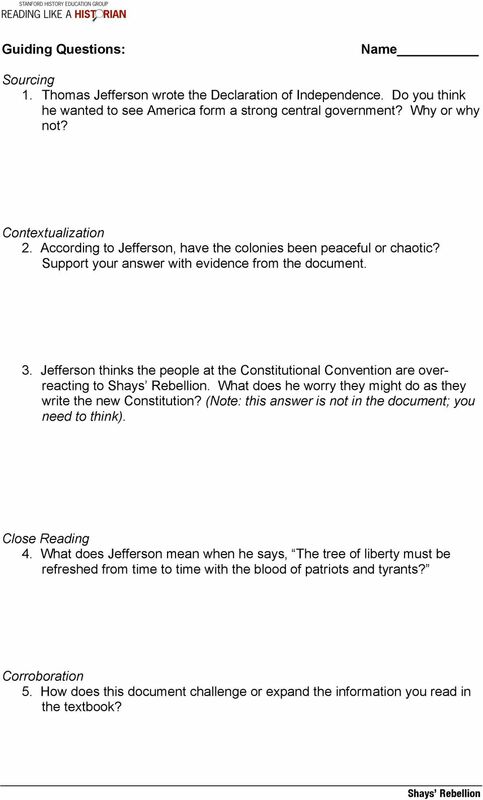 Do students agree with Jefferson s assertion about the tree of liberty? How does this letter challenge or expand the textbook s account? Why might many textbooks make it seem like everyone wanted a strong central government after? Citations: The American Vision. (2003) Eds. Joyce Appleby, Alan Brinkley, Albert Broussard, James McPherson, Donald Ritchie. Glencoe McGraw-Hill. pp Thomas Jefferson letter to William Smith. Nov. 13, Copyright 2009, Avishag Reisman and Bradley Fogo. 3 Textbook Excerpt: The American Vision The property owners fears seemed justified when a full-scale rebellion, known as, erupted in Massachusetts in The rebellion started when the government of Massachusetts decided to raise taxes instead of issuing paper money to pay off its debts. The taxes fell most heavily on farmers, particularly poor farmers in the western part of the state. As the recession grew worse, many found it impossible to pay their taxes as well as their mortgages and other debts. Those who could not pay often faced the loss of their farms. Angry at the legislature s indifference to their plight, in late August 1786, farmers in western Massachusetts rebelled. They closed down several county courthouses to prevent farm foreclosures, and then marched on the state supreme court. At this point, Daniel Shays, a former captain in the Continental Army who was now a bankrupt farmer, emerged as one of the rebellion s leaders. In January 1787, Shays and about 1,200 farmers headed to a state arsenal intending to seize weapons before marching on Boston. In response, the governor sent more than 4,000 volunteers under the command of General Benjamin Lincoln to defend the arsenal. Before they arrived, Shays attacked, and the militia defending the arsenal opened fire. Four farmers died in the fighting. The rest scattered. The next day Lincoln s troops arrived and ended the rebellion. The fears the rebellion had raised, however, were harder to disperse. A Call for Change People with greater income and social status tended to see the rebellion, as well as inflation and an unstable currency, as signs that the republic itself was at risk. They feared that as state legislatures became more democratic and responsive to poor people, they would weaken property rights and vote to take property from the wealthy. As General Henry Knox, a close aide to George Washington, concluded: What is to afford our security against the violence of lawless men? Our government must be braced, changed, or altered to secure our lives and property. These concerns were an important reason why many people, including merchants, artisans, and creditors, began to argue for a stronger central government, and several members of the Confederation Congress called on the states to correct such defects as may be discovered to exist in the present government. The confederation s failure to deal with conditions that might lead to rebellion, as well as the problems with trade and diplomacy, only added fuel to their argument. Source: Excerpt from The American Vision, a high school U.S. History textbook published in 2003. 4 Thomas Jefferson on (Modified) Paris, November 13, 1787 The British have so long hired their newspapers to repeat every form of lies about our being in anarchy, that the world has at length believed them, and we have believed them ourselves. Yet where does this anarchy exist? Where did it ever exist, except in the single instance of Shays rebellion? God forbid we should ever be 20 years without such a rebellion. What country before ever existed without a rebellion? And what country can preserve its liberties if their rulers are not warned from time to time that their people preserve the spirit of resistance? Let the people take arms. The remedy is to present them with the facts, pardon and pacify them. The tree of liberty must be refreshed from time to time with the blood of patriots and tyrants. It is its natural manure. Our Constitutional Convention has [made too much of Shays rebellion]: and in the spur of the moment [I worry they will over-react]. 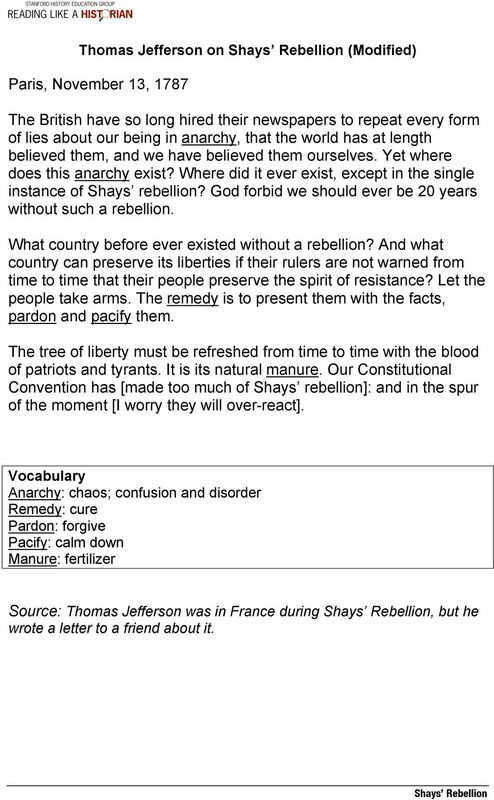 Vocabulary Anarchy: chaos; confusion and disorder Remedy: cure Pardon: forgive Pacify: calm down Manure: fertilizer Source: Thomas Jefferson was in France during, but he wrote a letter to a friend about it. 5 Guiding Questions: Name Sourcing 1. Thomas Jefferson wrote the Declaration of Independence. Do you think he wanted to see America form a strong central government? Why or why not? Contextualization 2. According to Jefferson, have the colonies been peaceful or chaotic? Support your answer with evidence from the document. 3. Jefferson thinks the people at the Constitutional Convention are overreacting to. What does he worry they might do as they write the new Constitution? (Note: this answer is not in the document; you need to think). Close Reading 4. What does Jefferson mean when he says, The tree of liberty must be refreshed from time to time with the blood of patriots and tyrants? Corroboration 5. How does this document challenge or expand the information you read in the textbook? Shays Rebellion. Task Question: How did the leaders of the American Revolution view Shays Rebellion? Hamilton vs. Jefferson Lesson Plan. Central Historical Question: What were the differences between Hamilton and Jefferson? Radical Reconstruction Lesson Plan. Central Historical Question: Why was the Radical Republican plan for Reconstruction considered radical? The Battle of the Little Bighorn Lesson Plan. Central Historical Questions: Who was responsible for the Battle of Little Bighorn? LESSON PLAN CODE: SS-8-3 SUBJECT: Social Studies / American History GRADE LEVEL/COURSE: Grade 8 / Social Studies TITLE: The Whiskey Rebellion TEACHER(S) NAME(S): Megan Bell ALIGNMENTS: PA Standards: 8.1.8.B. Populism and the Election of Central Historical Question: Why did the Populist Party attract millions of supporters? Manifest Destiny Lesson Plan. Central Historical Question: How did Americans justify Westward Expansion?